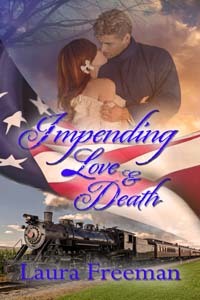 Impending Love & Lies, the third book in Cuyahoga Falls author Laura Freeman’s Civil War-era series, retains its Western Reserve setting and continues with the story of the four younger Beecher sisters, distant relatives of the Uncle Tom’s Cabin author and local abolitionists who work summers on their grandfather’s canal boat. Though their current trip isn’t a passenger run, Captain Donovan accepts an offer of double the fare to take Blake Ellsworth from Akron to Peninsula. Blake, who recently inherited a few hotels, has just sold one of his properties and is carrying a large amount of gold, which makes him a target for the barbarous Cassell brothers. He is immediately smitten with Colleen, who goes by “Cole” and who serves as first mate on the Irish Rose. She’s been courted for six months by a man from a well-off family and expected a proposal, but has just learned he’s married a rich New York girl. There’s a spark between Blake and Cole, but he’s injured in a shootout with the Cassells. Cole and her sister Jess go to Washington to help another sister, and Blake, who intends to enlist when he’s healed, joins them. They end up as medics at the Antietam battlefield, working with Clara Barton. These scenes, as in Book Two, Impending Love & Death, are sharp and realistic, and the letters from their hometown boys serving in the valiant Seventh and 29th Ohio Volunteer Infantries are deeply affecting. Impending Love & Lies (362 pages, softcover) costs $16.99 from Wild Rose Press. Laura Freeman will sign books from 1 to 3 p.m. Saturday at Learned Owl Book Shop, 204 N. Main St., Hudson.